I often get a lot of stick for living in South London. I know this may come as quite a surprise, but there are a lot of haters out there (crazy, I know!). No variety, nowhere decent to go eat and drink, too many muggings, too ethnic, the criticisms continue unabated. I, however, am proud of living in South London and am here to champion it's cause. My particular neighbourhood is Camberwell. Most of my regular readers already know this, I bang on about how great it is often enough and today, I am going to bang on about it a little more. You see, in the last week, whilst I have been...erm...freelancing from home, I have found the need to look for more local establishments to satisfy my lunchtime hunger pangs as well as providing me with my daily caffeine fix. Thankfully, I have discovered that I am rather spoilt for choice. 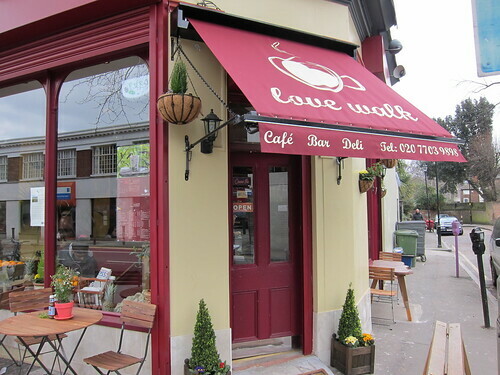 Located on the site of the unfortunate O Galo (a Portuguese restaurant which was only remarkable for the fact that it was always empty), Love Walk cafe was absolutely bustling when I walked in. I know it was lunch time, and that there are precious other alternatives in the area for the staff from the local hospital to get sustenance, but I was pleasantly surprised. It was a nice change to see this place busy. Inside is adorned with global trinkets and feels warm and cosy. 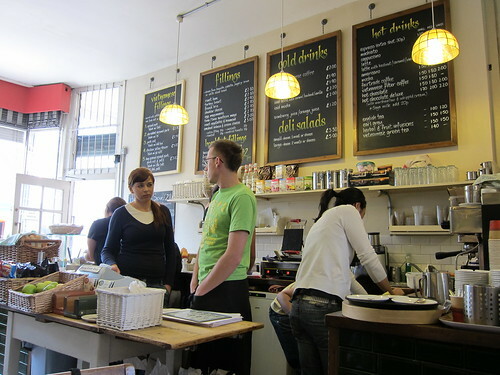 As for the food, expect your standard cafe fare, sandwiches with coffee, smoothies and a limited range of hot foods. 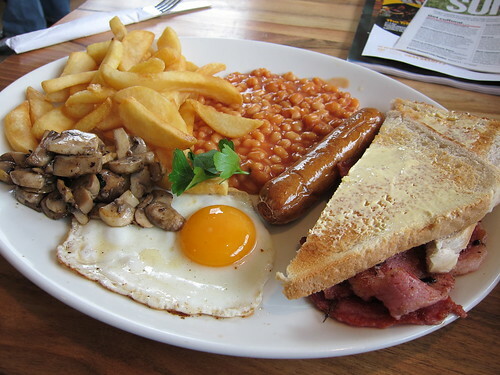 I fancied a heartier meal so opted for their full breakfast, which was average at best, but filled me up. So there you go, better than what was there before, but not stellar. Located a few doors down from Love Walk cafe is Cafe Bay. It appears that the banh mi revolution has even reached Camberwell as these Vietnamese baguettes make up most of the menu here. Of course there are Western fillings, but seriously, why would you order a ham and cheese sandwich when you can get one filled with pate, caramelised pork, pickled vegetables and herbs. I went for the Bay special with a Vietnamese iced coffee alongside. 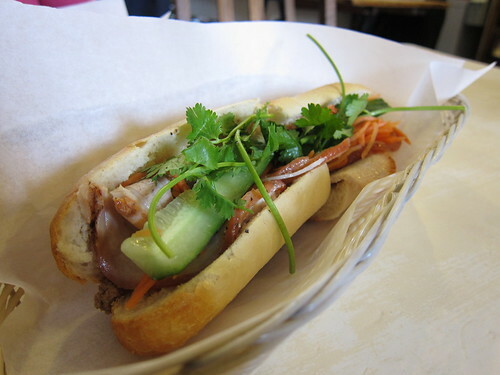 Filled with two types of pork, as well as that essential smattering of pate, I really enjoyed my banh mi. I am still seeking that elusive soft rice flour baguette (apparently banh mi 11 in Broadway market is where to go) but this was as good an example as I have tried. 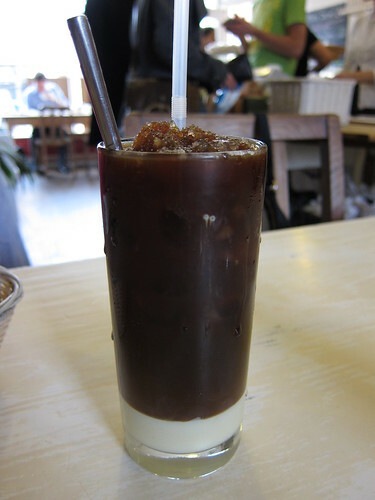 The iced coffee was thick and sweet, and the coffee sat on top of the condensed milk ready to be mixed together. Cafe Bay does things simply but does them well. 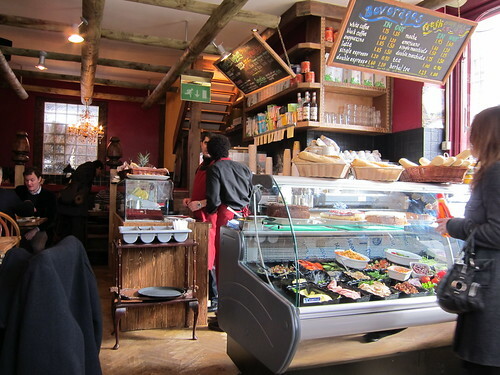 Their banh mi is delicious and the cafe is functional as opposed to beautiful. A nice place to have lunch and a benefit to the area. 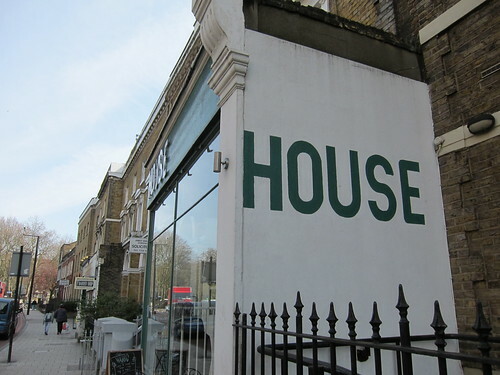 The last of my happy trio of Camberwell cafes is House. So what makes this any different from the other two? Well, a few things actually. Firstly, it has a small gallery downstairs, something that the other two definitely don't have. If my memory serves me right, it was always a gallery and then they converted the downstairs space, whilst turning upstairs into a cafe. The second point, and definitely the more pertinent for me, is that it has free wifi. Well, only before 12 and after 2, which is sensible as it dissuades the campers from taking up prime real estate during their lunch period. As there is no "kitchen" bar a sandwich toaster, the offerings are fairly limited but the sandwiches are all freshly prepared and actually look pretty stunning. Personally, I go there for a cup of coffee, somewhere to chill out and it has been one of my impromptu offices during the last week. It's a very welcoming place and perfect to wile away a few afternoon hours. Definitely check out their orange juice, freshly squeezed and delicious. These all sound absolutely great EuWen, and it's great that you're discovering so many local gems! It's almost enough to tempt me to explore the exotic climes of SE5...*almost*! 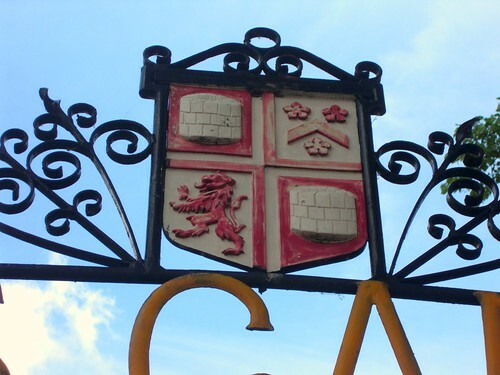 Keep flying the flag, but don't get too many people excited about it... otherwise the lovely cafes, pubs and restaurants we enjoy so much get full of out of towners! Ahh finally a bit of love for Cafe Bay - it's so seriously underrated! And thanks for reviewing Lovewalk - my loyalty to Cafe Bay may have to be put on halt for a bit while I give Lovewalk a tryout! Cafe Bay was the pioneer of banh mi in London, opening over 3 years ago and may be opening another store in the very near future. Their version is decent although the bread is the standard part-baked and baked off daily kind. Banhmi11 use a bread much closer to the authentic Vietnamese bread as it is made specially for them, although it does not use rice flour. Rice flour makes the bread lighter but not softer. Banhmi11 offer excellent choice of fillings now, the steak is awesome! I spent so much time in cafe bay when I worked at King's. There was just nowhere else within walking distance and a bahn mi at lunchtime - I mean who wouldn't? The Love Walk Cafe was something else before the Portugese place even wasn't it? That was always empty too. I reckon that site is cursed so we shall see how the LW cafe does! The Cafe Bay people are opening a cafe/restaurant called Banh Mi Bay on Theobalds Road Holborn this month...sign is up already. And they will have that light airy Vietnamese bread that everyone wants. Also selling other hot food like Pho. Reading this post makes me jealous. 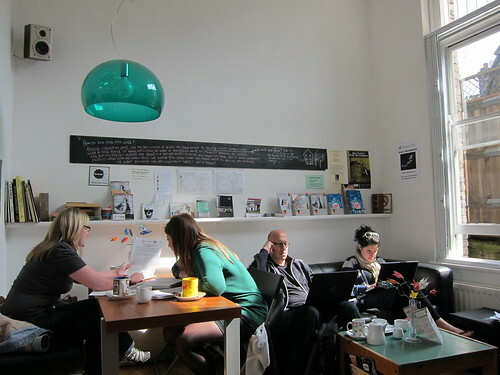 Jealous that I don't get to do 'freelance' work from home and just spend most of my time sitting in the café's of Brockley, Deptford and of course Camberwell, pretending to myself that I'm a go getter and being productive.